Today we're going to take a brief look at Kate's calendar for June, including official engagements and events there is a strong possibility the Duchess will attend. As most of you already know the Duchess will join the Royal Family for the Queen's Coronation Service at Westminster Abbey on Tuesday June 4th. The service commences at 11 a.m. and there will be a luncheon afterwards. I'm very much looking forward to this one and will have a post published as soon as photos become available. Speaking of the coronation, Her Majesty is expected to celebrate the 60th anniversary at her favourite royal residence Windsor Castle, where she is likely to attend a church service at a private chapel within the estate. Sky have some very interesting coverage to mark the anniversary. It's a tremendously important day for the Queen and Prince Philip. Long may she reign. We'll look at the two most likely weddings: Kate's ex boyfriend, lawyer Rupert Finch is marrying Beulah designer Natasha Rufus Isaacs in Cirencester, while William's friend Peregrine Hood is marrying Vogue fashion editor Serena Nikkah in Wiltshire. Perhaps Kate will attend the Finch wedding with Pippa? and William will attend the Hood wedding? It's certainly something of a dilemma for the royal couple but I think it's safe to say we'll see them grace at least one wedding next weekend. With a summer full of society weddings comes hen nights and stag parties. William and Harry enjoyed a rare night out before the royal baby's arrival, emerging from Tonteria Nightclub in Sloane Square after attending the stag do of one of their closest friends, Thomas van Straubenzee. Thomas van Straubenzee is set to marry long-time love Lady Melissa Percy on June 22 in St Michael's Church. Melissa is the youngest daughter of the Duke and Duchess of Northumberland and the reception will take place at the Percy home, Alnwick Castle (used for exterior and interior shots in the Harry Potter movies). William and Harry are expected to play a central role at the society wedding as ushers and it is very much assumed Kate will be in attendance. Prince Harry's ex-girlfriend Chelsy Davy is Melissa's best friend and will be chief bridesmaid at the event. On June 13, Kate will perform her last solo public engagement before the arrival of Baby Cambridge, christening the Royal Princess, a new ship owned by British-American cruise line Princess Cruises. Other notable godmothers include Princess Diana and Audrey Hepburn. 'The Royal Marines Band and the pipers of the Irish Guards will perform as she christens Princess Cruises' 3,600 passenger Royal Princess in Southampton before taking maternity leave. Keeping with tradition Kate will smash a bottle of champagne over the ship's hull. We should also see Kate on June 15th and 17th for Trooping The Colour and the Order of the Garter ceremonies. Royal Ascot takes place later this month (it's not considered likely Kate will attend, but worth noting) and William and Harry are scheduled to play in several polo matches. Kate has watched William's matches for years and could very well go along to one or two depending on the dates. 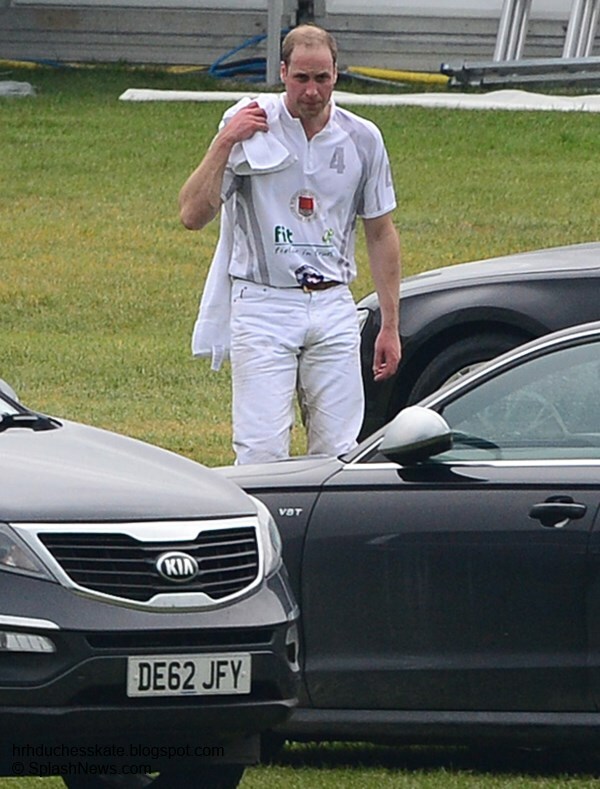 William playing a charity polo match last week. It's shaping up to be a rather busy month for the Duke and Duchess who are expecting their first baby next month. No doubt an incredibly exciting time for them both! The main story in the press this week has been "news" the Queen has given Kate her approval to hold a baby shower in Berkshire with party planner Pippa taking charge of the event. I was doubting the validity of the story from the moment I read it and was interested to see royal correspondent Rebecca English's view on the story. Cover-girl Kate features in Hello! Magazine again this week. Great update, thanks Charlotte! It is a very busy month and with Princess Madeline's wedding next Saturday too it's all go. I really appreciate the 'round up' so I can keep track! I think William is very good friends/used to date Lady Natasha Rufus Isaacs too so how they will divide themselves I don't know! She is such a lovely person (I liaised with her at Beulah)I can't wait to see her dress!! Sorry, me again! Meant to ask would permission really be needed/required from HM to hold a baby shower??? I wouldn't imagine so. Baby showers are not all that common here and according to a very reliable source of Rebecca English, the entire story is made up. It did sound a bit odd! Whether or not a baby shower is actually taking place, the Duchess and her sister do not require the Queen's "approval" to hold one. How silly. There are strict rules about members of the Royal family accepting gifts from people they do not know, but I assume a Baby Shower is a party for friends which would, I presume, be acceptable. However they are not really a custom here are they? Perhaps I'm a bit out of date. Can't help wondering also if Catherine would travel to Northumberland for a wedding, so close to the birth. How fun that we'll be seeing a lot of Kate this month, since she'll be away from her public role the rest of the summer. I hope she continues to feel healthy and is able to enjoy these last weeks of her pregnancy. IMO the baby shower story and the "Kate's dilemma" article in the DM today are simply another excuse to include her name in the headlines. Unfortunately, they also serve to fan the flames where some of unkinder remarks are concerned. "simply another exuse to include her name in the headlines" - exactly,my opinion too. And the Hello headlines are always just so pathetic.. 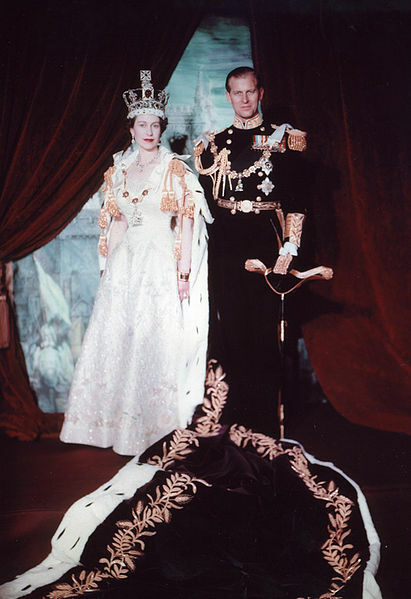 Looking forward to the coronation service tomorrow and hoping for some nice maternity outfit. BTW Her Majesty have worn lately some very cute outfits! If Kate has a baby shower or not. I hope she is showered with love from family and friends. It really is a fun thing to do. Gifts or not to be surrounded by those who love you ,talking , yes all things. "baby"
The gifts are the cherry on top the sundae. The special part is the friendships of supportive women. Great post as always Ms. Carlotte. I hope te Duchess and William go to one of the weddings together. I would hate for them have to attend by themselves. Has anyone seen te pictures of William out last night? There is no problem attending a stag party but when a married man is pictured with another woman I tink that is a problem. I am not saying anyting happened but I don't think a married man should be pictured with other women when you have a very pregnant wife at home. There is a picture of William giving tis woman a look that if he was my husband I would really be uspset. Just call me old fashion. What pictures are you talking about Pauline? Do you have a link? Sounds like a lot is going on with the Royals, and I love that yellow coat Kate has on in the magazine shot. I wouldn't mind seeing Prince Harry hook up with designer Natasha Rufus Isaacs' business partner provided she is still single. I can't recall her name, but she is a darling girl and seems to have a good head on her shoulders. I keep hoping Harry can find someone who really adores him as much as his mother did and whom he can love, respect, and enjoy in return. She has got to be out there somewhere, and when I read about other weddings I keep hoping that he finds his true love. That is my prayer for him. I love happy updates! Where to begin..... Really looking forward to the service tomorrow. I am going with Kate looking happy and healthy in a bespoke Alexander McQueen with a half up half down hair do and a beautiful hat on top. :) We'll see. She will look lovely and will be a ray of sunshine on a happy day of celebrations. Congratulations to the Queen! Also looking forward to all these weddings approaching! What will everyone wear, who will attend, the bride's dresses..... I am a June bride and it's a wonderful season of happiness! Can't wait to hear the updates Charlotte! My only disappointment.... Would love to see "William and Catherine will make a surprise appearance at the Coronation Concert on June 13 after a glorious day christening the Royal Princess!" :) The month of June will be very busy! 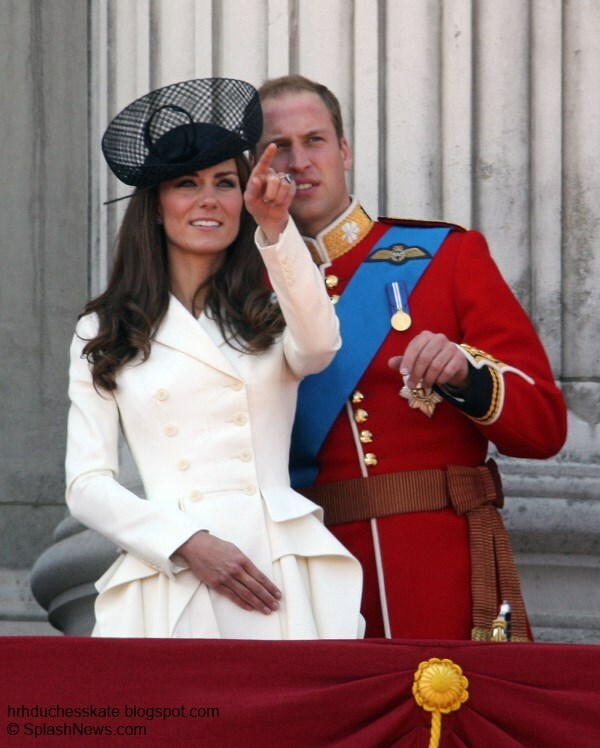 I'll hold out hopes in seeing Kate at Trooping the Colour! Thanks for the great update! Love Prince William in his polo attire. He looks tired, but dreamy! :) Attending a polo match somewhere is on my bucket list, but for now it's getting my precious kiddos off to school. It's the last week of school and then SUMMER VACATION! I hope you all have a beautiful Monday! Our pride and joy, 2011 Kentucky Derby and 2013 Dubai World Cup winner Animal Kingdom, makes his final start 18 June at Ascot. I hope members of the Royal family are able to attend, not expecting Kate to be there since her public calendar will be over at that point. Thinking how ancient the Percy family is, incredible history. Pippa is still friends with the bride's brother, I believe, so perhaps she'll be there too. Looking forward to your Coronation Service blog, Charlotte. By the way, your name is my favorite for Baby Cambridge, should it be a future Queen who arrives in July. I am suprised that there is no baby shower. They are ment to give the new Mom to be some help with clothes and larger items like swings and play pens. It is all in good fun. Can't wait for the baby to be born and all of the fun activities coming up in London. Wish I could be there. Thank goodness for utube. Thanks Charlotte for this great post. I am shocked that Brits do not have baby showers! They are wonderful times when friends and family comes together to have fun, play a few silly baby games and let the mom to be open gifts and eat. You always have 1or 2 for your first baby. I remember mine and it was 26 yrs. ago. I had lots of fun and got many things for the baby you couldn't have bought in a store. Knitted baby outfits from great grandma's not living any more that I still cherish. I hope Catherine has a healthy baby and her delivery is nice and calm. Keeping fingers crossed. Looking forward to June 4 and to all the other activities the Duchess has planned before her maternity leave. My heart is set on a girl. I will love to see Kate up and around! Sorry I do not have a link. It was posted on a fb page. It looked like it came from a cell phone. Like others, we're surprised to hear there are no baby showers also! Can't wait for the little one to come! I was wondering if we would see her at any tennis this year?! I mean Wimbledon is likely too close to the due date but Queens is next week and therebis a charity match with Murray, Llendl, Berdych and her old favourite Henman! Its not usually announced she will be attendig so a possible sighting i feel! However the most likely scenario is that Pippa will attend sans Kate which I feel is a shame but ofc am looki forward to baby Cambridge arriving! Kate loves Wimbledon and is a huge tennis fan. I know Andy Murray has a great chance of winning this year. However, will we see Kate there at over eight months pregnant? It's possible but not terribly likely. It will depend on how she's feeling of course.